The New York Times Bestseller, with a new preface from the author "This estimable book rides into the summer doldrums like rural electrification. . . . It deals in the truths that matter. "-Dwight Garner, The New York Times "This eye-opening investigation into our country's entrenched social hierarchy is acutely relevant. "-O, The Oprah Magazine "White Trash will change the way we think about our past and present." -T. J. Stiles, Pulitzer Prize-winning author of Custer's Trials In her groundbreaking bestselling history of the class system in America, Nancy Isenberg, co-author of The Problem of Democracy, takes on our comforting myths about equality, uncovering the crucial legacy of the ever-present, always embarrassing-if occasionally entertaining-poor white trash. "When you turn an election into a three-ring circus, there's always a chance that the dancing bear will win," says Isenberg of the political climate surrounding Sarah Palin. And we recognize how right she is today. Yet the voters that put Trump in the White House have been a permanent part of our American fabric, argues Isenberg. The wretched and landless poor have existed from the time of the earliest British colonial settlement to today's hillbillies. They were alternately known as "waste people," "offals," "rubbish," "lazy lubbers," and "crackers." By the 1850s, the downtrodden included so-called "clay eaters" and "sandhillers," known for prematurely aged children distinguished by their yellowish skin, ragged clothing, and listless minds. Surveying political rhetoric and policy, popular literature and scientific theories over four hundred years, Isenberg upends assumptions about America's supposedly class-free society--where liberty and hard work were meant to ensure real social mobility. Poor whites were central to the rise of the Republican Party in the early nineteenth century, and the Civil War itself was fought over class issues nearly as much as it was fought over slavery. Reconstruction pitted poor white trash against newly freed slaves, which factored in the rise of eugenics--a widely popular movement embraced by Theodore Roosevelt that targeted poor whites for sterilization. These poor were at the heart of New Deal reforms and LBJ's Great Society; they haunt us in reality TV shows like Here Comes Honey Boo Boo and Duck Dynasty. 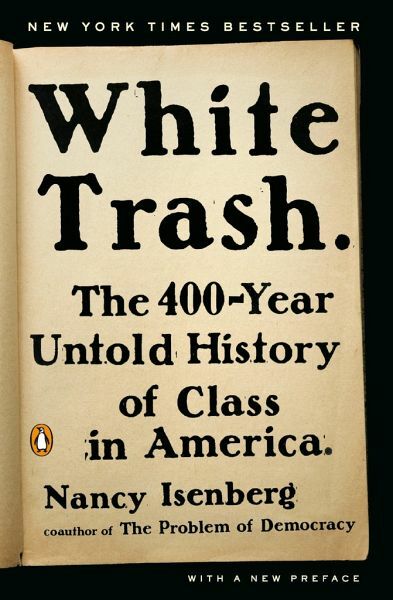 Marginalized as a class, white trash have always been at or near the center of major political debates over the character of the American identity. We acknowledge racial injustice as an ugly stain on our nation's history. 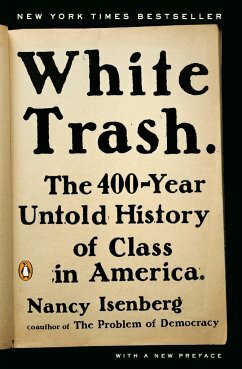 With Isenberg's landmark book, we will have to face the truth about the enduring, malevolent nature of class as well.